"I have attended numerous other technical conferences in the past and was a little apprehensive in attending the WITI conference because I wanted to leave with more than just great talk. I wanted more substance. 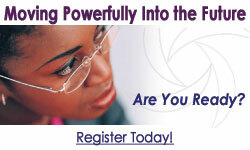 "WITI's 2003 National Conference blew me away. I was surprised at the level of professionalism and the caliber of speakers. I met women from different walks of life, from different countries in the world. The sessions and seminars were powerful and provided a wealth of knowledge. The speakers actually shared their experiences and knowledge! I had a wonderful time at this very enriching and rewarding event. I knew then I had found an organization to be part of. "What makes a WITI conference unique? WITI has something that cannot be bottled: the Spirit of WITI. It is their genuineness and commitment to advancing women. I recognized their authenticity. This conference restored my confidence that there exist out there women with a vested interest in helping other women actualize their dreams. I have found a group of women who are committed to creating new possibilities for the success of other women." 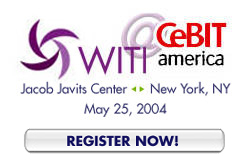 Don't miss the extraordinary opportunites of WITI's 2004 Conference Events, coming to Houston May 5 & 6 and to Silicon Valley June 8 & 9! Register today! A few weeks ago, while I was in Los Angeles for a retreat for Women's History Month, my son surprised me by taking me to a special screening of Iron Jawed Angels. I had not seen any previews, read any reviews and had no idea what to expect from the film. What an amazing evening! "Your Money & Your Life"
"TELE POWER - Using The Telephone To Advance Yourself And Advance Your Business"
"It's Never Too Late - and Never Too Early (Ten Things You Can Do Now to Catch up on Your Retirement Savings)"
"How To Communicate Effectively At Work". Recently, Melanie shared her story with the WITI Network in Austin, Texas. Hear how she survived and learn what you must know about heart disease by checking out the video of her presentation, available now in the WITI Members' Area! Don't forget to plan now to see Mellanie at WITI's Southwestern Regional Conference May 7-8, 2004, where she will be speaking on "Designing the Plan for Your Life and Health". 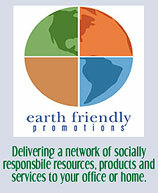 Earth Friendly Promotions delivers a network of socially responsible resources, products and services. When it comes to creating a conscious lifestyle, Earth Friendly Promotions is the leader. We create entire eco-effective environments at your place of business or in your home. Saying "Yes!" to socially responsible products and service is easier than ever, and it makes good sense for you and for the planet. WITI partner WIPP needs your help! Do you own your own business? WIPP (Women Influencing Public Policy), the nation's largest bi-partisan public policy organization advocating for, and on behalf of, women business owners and women in business on economic issues, needs your help! To effectively represent you in Congress, it's helpful to have the North American Industry Classification System Codes (NAICS Codes) for their membership base. Since WITI is a WIPP Coalition Partner, all WITI members are automatically WIPP members. Enable WIPP to enhance their continued lobbying activities for women in business. Look up your business's NAICS Code at http://www.census.gov/epcd/www/naics.html. Then send it and your zip code to [email protected] or fax to 415-434-4331. It will just take a minute to make sure your voice is heard in Washington. If the world stays on its present course, terrorism and conflict may take the lives of over 100 million people during the next three decades. Give women the opportunity and resources to combat poverty and hopelessness that foster terrorism and the gloomy forecast improves, writes Curt Weeden, author of How Women Can Beat Terrorism. A billion-dollar grant-maker who has worked for 30 years with international development organizations, corporations and foundations, Weeden concludes that only if women in the U.S., Europe and other industrialized countries take the lead are women in poorer nations likely to have a realistic chance of improving their quality of life and creating a climate that discourages terrorism. How Women Can Beat Terrorism presents a simple but compelling plan for helping billions of men, women and children living in poverty while at the same time making the Western world less prone to a multitude of deadly terrorist attacks. How Women Can Beat Terrorism is available from the author's website, Amazon and other bookstores near you. EPSON manufactures award-winning digital cameras, printers, scanners, and other imaging solutions. People who thrive in our environment love challenge, ownership, and a fast pace. We have a Merchandising Specialist position available. We offer a competitive salary and excellent benefits that include medical, dental, vision, tuition reimbursement, 401(k)w/company match, 13 paid holidays that includes a week in December, etc. Our headquarters is located in Long Beach, CA. Search for Epson America jobs on WITI4Hire. In this challenging role as the DS Technical Architect, your primary responsibility will include architecting, developing and implementing PwC's technology roadmap. In support of the CDO and EA leader, you will drive integration strategies for Architecture Services, Middleware Services, Portal Services, the Portfolios to include- People Systems, Financial Systems, Engagement Systems, and the Market Leadership. Services in their mission to support the information technology strategies, which meet the core business requirements for the client. Further, your approach will be innovative and proactive to ensure all aspects of integration enhances the Great Place to Work environment we are working towards within US IT and Development Services. WOMEN WORKING WITH WOMEN: "In the Company of Women"